My first introduction to the Faroe Islands was while watching the show, Househunters International. At that time, it reminded me of a smaller version of Scotland or Ireland; I was intrigued. Then, while researching photography trips to Iceland, I found an excursion being offered by Iceland Photo Tours. A scroll through the photos on the site had me sold and it wasn’t difficult selling my photography buddy on them either. We immediately booked the trip for August 2017. I have been serious about amateur photography for about 4 years. It was an activity my husband and I enjoyed doing together, and then with his sudden passing in January, 2013, it became an outlet for me; something to get me out of the house. I joined two photography clubs – one a monthly meeting type of club, the other a get outdoors, hike, enjoy nature and take some pictures type of club. I met some wonderful new friends and with the second club, ended up doing road trips to Texas (I live in Ontario, Canada), Quebec, Newfoundland, the Prairies, and the Canadian west. My new photography friend, Daphne, and I had been discussing Iceland and the northern lights for awhile, so it was with that in mind that I had been following the Iceland Photo Tours site. Once we saw the Faroes, it was never mind the northern lights, we were going on an adventure to a place no one had even heard of! Getting there is not easy. We flew to Keflavik, Iceland, bussed to Reykjavik, and then boarded another plane for the flight to Vagar, Faroe Islands. I am a nervous flier, so when the approach to the airport in Vagar, was between two cliffs, there was huge trepidation. Later, I discovered that the cliffs were farther apart than they appeared from the aircraft, which relieved my mind for the flight out. We were staying at the Hotel Vagar, a 5 minute walk from the airport and since we had arrived a day early, were able to become familiar with the surroundings, walking down to the town of Sorvagur, marvelling at the small plots of farmland, the sheep, the horses in the backyards, and the order of it all. We had our first encounter with the national bird – oystercatchers (or Tjaldur as a local woman informed us); watched in horror as a tern and gull fought to the death, and admired a family raking and gathering hay on their small plot. Already, we realized that we had made the right choice. We met up with the rest of our group the next afternoon: 2 ladies from Poland and 2 from the US (none of whom knew each other) and our photographer, Daniel Kordan, who was a bit nervous heading up an all female group. I was unaware at the time how well known Daniel was in the photography world but I quickly learned that he had a special touch with a camera. He was also an amazing teacher and leader; he had the “knack”. After dinner, we headed out for our first photography shoot at the tiny village of Gasadular where the waterfall Mulafossur takes pride of place. A beautiful spot among countless beautiful places on these islands. The next morning we took the ferry to the island of Mykines to photograph the puffins. I had seen puffins in Newfoundland, but nothing like this. They were so close and so calm and so photogenic! We had hoped to find a few holding sand eels in their beaks and they did not disappoint. The village was also wonderful. The houses made of wood (where DO they get the wood?) and the grass roofs were so clean and well-maintained. Wild flowers were everywhere and gulls and terns filled the skies. What a magical day. I shall never forget it. The following morning we drove to Torshavn, the capital city. We were amazed to learn that many of the islands are connected by tunnels, not bridges and that there were even tunnels through the rock. The transportation system was excellent. In Torshavn, we stayed at the Hotel Torshavn. For dinner that evening, Daniel had arranged to have us eat at Aarstova, where the specialty is braised lamb. I am not a lamb lover, but was willing to try it. Turned out to be one of the best meals I have ever eaten. I devoured that lamb and went back for seconds. 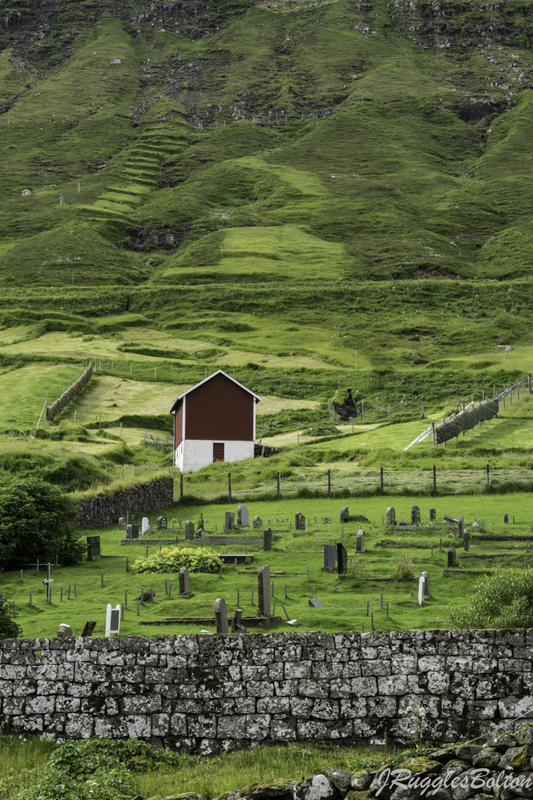 We used Torshavn as our home base for the next 3 days, travelling extensively throughout the islands of Streymoy, Eysturoy, Bordoy, and Vidoy, with extensive photography stops at the villages of Gjogv, Tjornuvik, Vioreioi and Eioi. At one point, I think we all lost track of which island we were on and how many tunnels we had been through! Every stop brought new wonders and soul stopping beauty. We were blessed with wonderful weather; so nice that there were people sunbathing on the beach at Tjornuvik. Watching the children playing in the sand and water was one of the highlights of my trip. However, every evening the clouds moved in and our hunt for the perfect sunset was frustrating, although we came close in Eioi. It didn’t matter though, because the days were so filled with delight that expecting sunsets as well, almost seemed too much. My favourite places? It is hard to choose. 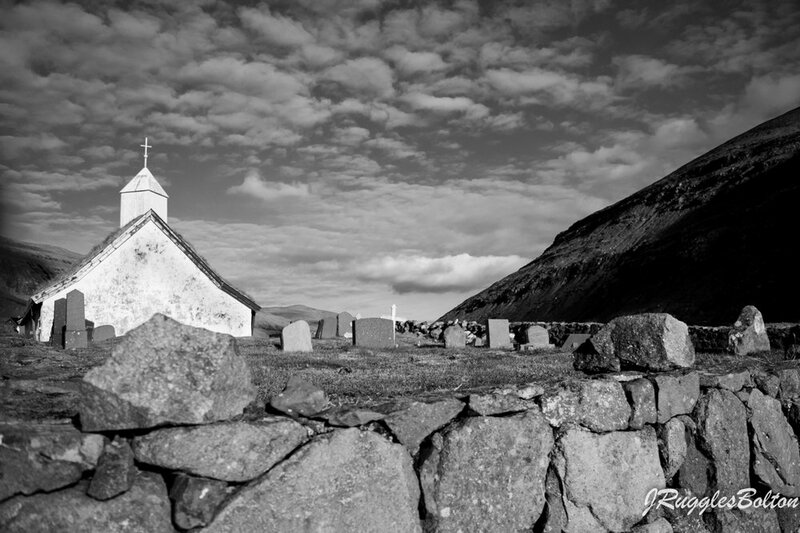 Saksun, Gjogv and Tjornuvik probably top the list – and of course Mykines with its puffins. My dream is to return someday soon. Christmas in the Faroes would be an amazing experience, I think. But one thing I know, I will return. The land has captured my heart.